Many people think that browsing websites is a fairly anonymous practice. Most people I speak with believe that unless they specifically provide information to a website it doesn't know anything about them except possibly their IP address. This is a flawed assumption. This isn't through any special magic, just using standard code. It is a surprising amount of information though. Want to see what information you are leaking, and how to stop it? Go to http://webkay.robinlinus.com and take a look at the results. The nice thing with this website is it will offer you suggestions on how to plug the holes if you want. Fair warning, some of the fixes may limit the functionality of other websites. Happy surfing, and happy holidays! Powerline adapters have been around for a while now in various formats. A powerline adapter lets you use your home's electrical wiring to transmit/receive network traffic to places where you have no other network connection or wifi signal. Recently I purchased a pair of HooToo AV600 powerline adapters to see how well they worked. HooToo claims speeds of up to 600mb/s can be achieved using their product, and they are safe to use as the pairing process protects the traffic while travelling through your electrical wiring. To be fair, HooToo does mention the state of your home's electrical wiring will affect performance. In my case I was able to achieve about 65mb/s, just over 10% of the top end claim from HooToo. Given my home was built in the 80's I admit the wiring may not be optimal for ethernet-over-power. What I really liked about the HooToo product is it includes a pass-though electrical socket on the front, so you don't actually lose an electrical outlet with their system. Not all powerline adapters do this, so you can lose the ability to plug in a device with some of the competition. The biggest complaint I had with the HooToo devices is the instructions they ship with for pairing are wrong. HooToo needs to fix this as I'm sure it's led to purchaser frustration. That said, it's not insurmountable. To pair the devices you plug in the first adapter close to your router or switch and connect an ethernet cable from the adapter to the router/switch. Next you plug in the second unit wherever you want service in your home. On the unit by your router you press the "Pair" button for about 2 seconds, then go to the 2nd unit. Press the "Pair" button on the second unit for about 2 seconds. That's it, your units should now be paired and you can plug an ethernet cable in to the 2nd unit and use it to connect a computer, media server, anything you want. If you don't have really fast wifi in your home this might be a cheap way to overcome performance barriers without investing in a mesh wifi system. The HooToo system is expandable, meaning you can purchase and add additional adapters, placing them wherever you want in your home. Overall I'm happy with the experiment. The pair of adapters cost $50CDN on Amazon, and just under $37USD if you live in the USA. If you've got just 1 or 2 problem spots connecting a desktop computer or media server this is a pretty inexpensive way to get the speed you need. I've been running the Ring Video Doorbell for a little while now and I'm a fan. I love the fact that I get alerts when someone starts walking to my door, and another if they press the doorbell. I really like that I can talk with people even if I'm not home, and that the system captures audio & video for later playback or sharing. The one surprise I had when I bought the system was a lack of a chime for inside the house. Most of the time the fact that my smartphone or ipad will go off when someone approaches the door is fine, but occasionally I have need of an actual chime. It turns out Ring has you covered on this front, for a small fee. The Ring Chime plugs in to any wall outlet, and you use the Ring app to join it to your WiFi and connect it to the doorbell unit. Setup was a initially fast, it uses the standard "Ring" music by default, but there are a host of other noises it can make from different musical instruments to simulating barking dogs. After a brief consultation with my wife we decided to use a traditional doorbell "Ding Dong" sound. The frustration began to kick in here. No matter what I did the setting wouldn't save. Finally I read up on how to update the firmware of the device. Turns out it's as simple as unplugging it and then plugging it back in. I did this, it updated it's firmware, and after that everything began working as it should. A small kink that Ring could probably communicate better to their clients, but otherwise I have to say I still think it's a fantastic product. If you're starting to put together your wish list for the holidays, you might want to add the Ring doorbell to it. As part of my Black Friday shopping I ordered the Ring Video Doorbell. I've been intrigued by the device for some time, and the claims of it helping to reduce break & enter instances had my attention. Because I didn't have an existing wired doorbell I needed to charge the unit using a micro-USB cable. Even using the more powerful charger from my old Samsung phone it took about 5.5hrs to fully charge. Ring claims I'll need to do this 1-2 times per year, and the app will notify me when power is getting low. At this point I used the app to join the Ring doorbell to my wifi. Next was the physical installation. This part was a breeze, Ring includes almost everything you need right in the box including a screwdriver, drill bit, and level. The Ring app guides you through the install process with a well done and easy to follow video. It took about 5 minutes to install the unit and then I was on to configuration. From the app you can invite other people to have access, so I added my wife's email address and Ring sent her an email with instructions for getting set up on her phone. Next I found you can adjust the motion sensor settings inside the app. By default it will trigger on movement up to 50 feet away. That would likely have it chiming every time a car drove down the street, so I decreased the sensor to something a little more reasonable. The interface uses an intuitive drag line to adjust sensitivity, no complicated learning curve there. I was pleasantly surprised to learn Ring will work with the Wink home automation hub. You can program robots to automatically do things when the motion sensor goes off, the doorbell is pressed, or both. I've got it firing some actions now if the doorbell is pressed between sundown and sunrise, and the Wink automatically adjusts sunset/sunrise for the time of year so I'll never have to tweak those settings. Literally as I was writing this review from my office I got my first real use out of the Ring doorbell and it was a great experience. 2 men rang the bell. The app on my phone chimed and as I opened it I had full audio and 720p quality video of the guys. I asked them who they were, they said they wanted to talk to me. I asked who they were again and they claimed to be students, which I found odd as they appeared to be in their 40's. They claimed they were doing a bible competition and wanted to talk. At this point I indicated I wasn't interested, and was able to watch them leave my property. The entire exchange was immediately available on my phone to replay or email, which would be incredibly useful if I needed to forward it to the police. After seeing the Ring doorbell in action I'm a fan. I love that I can see and talk to anyone at my door even if I'm not home, and that it captures audio and video automatically. Is it a necessity? Absolutely not. But if you're in to home automation it's a very handy device that can also give you some extra peace of mind. If you go online you're probably aware that some of your activity may be monitored by your employer, but what about your government? Traditionally some form of oversight was required to keep a cyber-eye on citizens. That's not the case in the UK any longer. The Investigatory Powers Bill was passed by Parliament this month after over a year of debate and amendments. The bill gives multiple government organizations, including police, food regulators, fire officials, and tax inspectors the authority to review the web activities of everyone in the country. Internet Service Providers will be required to keep copies for a year of every website someone visits, as well as every app they use, all for review at the discretion of the government agencies. What's even more troubling is this may set a precedent other countries try to follow. It's a massive blow to personal privacy, but there is something UK citizens can do about it, and you can too. A VPN (Virtual Private Network) creates an encrypted tunnel between you and the VPN provider's servers. All traffic between you and the provider appears as gibberish to regulators. In this case I'd suggest UK citizens buy VPN services from companies located outside the UK. Some European countries have very strict privacy laws, severely reducing the likelihood that any information will ever be successfully requested from the VPN provider. What's more, the good VPN providers refuse to keep logs of pretty much everything, saying they can't be compelled to turn over information to authorities that they don't posses. Using a VPN is often a good idea, although you will feel a slight performance hit on your speed as a result. All your traffic would be routed through the VPN provider, so instead of going from your desktop to your ISP, then to the internet, it could go from your desktop to a server in Sweden, then to the internet. A little slower, but no one will be easily tracing anything back to you. If this interests you look around, there are deals to be had right now. Nord VPN (regarded as one of the best VPN providers around) is having a 75% off sale, you can buy a 2yr subscription for $72. VPN's may not be for everyone, you may feel you don't care if Big Brother watches your every online move. Personally I find the Investigatory Powers Bill troubling, and if a similar piece of legislature was introduced here I'd be rushing to sign up for a VPN. At least readers of this blog will know they have a choice. It's one of the best weekends for online shopping, and Amazon.com has some great items on sale that are worth mentioning. If you've been considering an Amazon FireTV now is the time. The 4K capable FireTV is on sale for $74.99USD. If you still have a first generation FireTV you won't be able to run Kodi's next release (Version 17) on it, as the Android OS on first-gen FireTV's isn't compatible. I've written about the FireTV in the past, it's a great device and by installing Kodi you can watch all the major television shows & movies without needing cable, commercial free. The FireTV stick is a more portable (and less powerful) option to the full FireTV. You can still load Kodi on the FireTV stick, but the memory and processing power isn't going to be the same as the FireTV. Still, if you're looking for a low-cost way to try Kodi the FireTV stick may be for you. The FireTV Stick is on sale for $29.99, a 25% saving on the regular price. The Amazon Echo Dot is on sale for $39.99USD, a savings of 20%. This cool little device is a great way to have Alexa enter your home without having to pay for the full Echo device. The Dot will connect to existing stereo or bluetooth speakers either using a 3.5mm headphone jack, or over Bluetooth. I've been eyeing the Dot for a while now and will probably order it today. The Amazon Echo is also on sale for $139.99 (regularly $179.99). The Echo does everything the Echo Dot does, but it also has substantial sound built in to it, making it a great option for the kitchen or anywhere else you might want to listen to music. It's fully integrated with Alexa, Amazon's cloud-based voice assistant. You can ask Alexa to call you an Uber, read you the news, give you a recipe for dinner, or a growing number of other things. I like the fact that Alexa can work with my Wink home automation hub, so I can ask Alexa to dim the lights or turn up the heat. I'm on the fence about ordering the Echo only because I live in Canada, so I can't easily return it. If I was in the US it would probably already be in my kitchen. With all these devices you're going to want to make sure you have good WiFi through your home. The Luma mesh WiFi 3-pack is on sale right now for $295.99, a 26% discount off the regular $399.99 cost. I've written about Luma before, I use this system personally and recommend it to friends. The folks at Luma are always seeking customer suggestions, and adding features & functionality. A big difference with Luma is the customer support. Luma does it right, they have invested in a strong team, ensuring any challenges you have are easily resolved. The system you buy continues to be enhanced long after you get it home, making it a better value as time goes on. With their focus on performance and online security you not only get great speed but it offers extra peace of mind on your protection level from many internet threats. There are a whole host of other deals on right now through Cyber-Monday. (I'm seeing laptops with decent specs for under $350 on Amazon.ca) so if you've been thinking about upgrading or just getting a new laptop for the kids it's definitely worth a look. Don't forget Black Friday/Cyber Monday deals extend beyond technology. Last night we found The Gap had everything listed for 50% off, and you also get 50% of your purchase value back in "Gap Dollars". Assuming you're going to buy something from The Gap in the future it makes a compelling case for ordering now. Whatever you're looking for this weekend good luck in your shopping. Did you find a great deal everyone should know about? Mention them in the comments section and share your finds! One of the great things about Android smartphones is the massive app library available . Between apps not available on other platforms (like Tasker), and a huge amount of free apps there's almost nothing you can't get your phone to do. The downside of smartphones in general and Android in this case is they often come with bloatware pre-installed from your carrier. Bloatware is software installed before you got the phone that you probably don't want. In many cases bloatware won't let you uninstall it, eating up resources on your phone needlessly. But you can do something about it. Systweak Android Cleaner will not only help free up memory and clean junk files, but it will let you uninstall apps, including bloatware. I hadn't been able to uninstall BBM on my phone and it annoyed me. BBM's a largely useless platform these days, there are far superior cross-platform messaging apps, so why would I want BBM eating up space on my phone? Once I installed Systweak Android Cleaner getting rid of BBM was fast and easy. There are free and paid versions of Systweak Android Cleaner. I found the free version did everything I wanted without excessive nag screens or limitations. If you're using Android and have bloatware you'd like to clean off your phone I suggest you give Systweak Android Cleaner a try. You paid for your smartphone, so why should your carrier get to decide what apps take up space on it? It's free and fast, what's not to like? Linux is an amazing Operating System, far more mature than Windows, faster, and more secure. These days it also has a great graphical interface to help users get around if they are used to Windows or Mac. I set my laptop to dual-boot between Windows 10 and Linux, and found that I almost never go in to Windows any more. I just can't take how much slower it is by comparison. Beyond better security and stability, Linux also boasts an absolutely huge free software library, letting you do almost everything you'd normally pay to do in Windows without reaching for your wallet. One of the handy things Linux can do for you is generate really strong passwords for you to use with different websites. Using a unique password for each website is a must these days. We've seen breaches of big companies like Yahoo, LinkedIn, DropBox and others where passwords were stolen and no one realized it until years later. So how can Linux create secure passwords for you? There are a many ways, I'll focus on the easiest two. Both require you using the terminal, a command-line interface that scares some people but shouldn't, it's just a fast place to get things done. First let's try Pwgen. As the name suggests it's an app for generating passwords. Open a terminal window by either pressing [CTRL]+[ALT]+ T or by browsing to the terminal app with your mouse. Once you enter your admin password the app will install. Now we are ready to make passwords. This will create a single 12 character password. To make it even stronger let's add instructions to include uppercase, numbers, and special characters. This will create a single 12 character password including uppercase, lowercase, numbers, and special characters. Because it's completely random it'll be incredibly hard to hack. If you wanted a longer password change the 12 to 14 and it will create 14 character passwords. There is another option for creating strong passwords, use GPG. GPG is included in your Linux distribution by default, and is really powerful. Not too likely anyone will hack that. Of course with all these passwords being so complex you'll need to use a good password manager. Lastpass gets great reviews if you don't mind paying for an annual subscription. If free is more your speed I suggest using Encryptr. It syncs the passwords across all your devices (encrypted of course) and can run on Linux, Mac, Windows, and Android. Passwords are your first line of defense, and many people get hacked because they can't be bothered to use strong ones. While it can result in some interesting celebrity photos being posted online it's entirely avoidable. Kodi is a fantastic home media system, and makes the decision to cut your cable much easier. Using Exodus with Kodi gives you access to pretty much every TV show and movie ever made for free, and with all the commercials edited out. One of the complaints people have with Exodus is if they have more than one device the lists of things to watch doesn't sync. Fortunately there is an easy way to take care of this problem. Head over to https://trakt.tv and sign up for a free account. Trakt is a service that will let you sync your watch lists to multiple devices. When you log in to Trakt the menu bar at the top offers several choices. To start with let's choose some TV shows. Click on the TV link on the left. You'll be taken to a screen with a list of many programs rated by popularity. 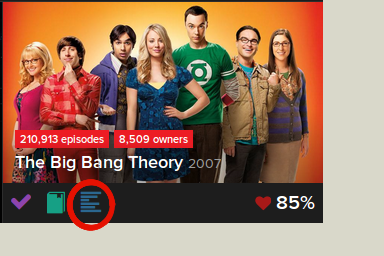 For this example we'll assume you want to watch "The Big Bang Theory". There are 3 icons below the picture of the show, click on the third one that looks like a list and select "Watchlist" from the pop-up menu. Repeat this step for all shows you want to add to your regular viewing selections. the shows you want to add and repeat the "Add to watchlist" process for each show. You can also use this process to add movies to your watchlist collection. Exodus is smart enough to maintain separate watchlists for movies and TV shows so it wont get too confusing. You can create other lists for convenience. In my case I created a "Kids list" that contains all the shows my kids like to watch so I can find them quickly. Once you have added all the tv shows and movies you want it's time to tell Exodus to use trakt.tv to sync your lists. From a computer, tablet, or smartphone log in to your trakt.tv account, enter the PIN, and choose "authorize Trakt"
Repeat the process on any other devices you're running Exodus on. Using trakt.tv is a really fast and easy way to set up your lists of shows you want to watch, and best of all it's free. Trakt is really handy when you decide to upgrade your streaming box, no more manually having to recreate all your program lists once you plug in your new hardware, everything just follows you to the new device. Now you can use the money you're saving by canceling your cable subscription to buy a bigger TV or a second device to run Kodi. Most of us get sent or download PDF's regularly, it's quite common for an organization to send forms for you to fill out in PDF format. But what if you want to edit a PDF you've been sent? Usually you're looking at having to buy a tool to let you alter a PDF. If you're running Linux you're in luck. Master PDF Editor is free for non-commercial use, meaning you can use it for any of your personal requirements. This great little tool will let you alter PDF's in pretty much any manner you like, including changing text or adding/removing pictures. The program is easy and intuitive to use, you can be editing PDF documents within minutes of downloading it. 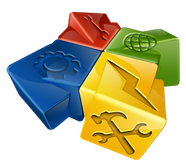 Master PDF Editor is just another example of the large range of free software available to the Linux community. For anyone who has children the internet is a double-edged sword. Kids need it for school, and just to generally learn and explore. At the same time parents need to shield their kids from the more adult areas of the internet, and control how much online time is consumed. Add to the mix how addictive the internet can be (ever seen a teenager lose most of a day on Facebook?) and the whole prospect can be overwhelming. Fortunately there's a simple way to take back control at a granular level. The Disney Circle is an amazing device you add to your network and suddenly you are in control. You can set categories of of websites people are allowed to view, which is fairly common, but the Circle does so much more. Circle will let you set time limits for how long a particular person can use the internet, and let you set a "bedtime" and "wake up time" for individuals. Between the bedtime and wake-up time their devices can't connect to the internet. No more late-night facetime or gaming. Individuals can also have an allowance of how much internet time per-day they get. Don't want the kids online for more than 3hrs/day? No problem, set an allowance for them and you're done. Circle goes beyond just connection time and actually lets you also set time limits for specific applications. Want to limit Facebook to 1hr/day but leave the internet open for 3hrs? No problem. Need to help the kids break a Minecraft addiction? Set Circle to only let them play Minecraft for 30 minutes. Each person gets a customized Circle page where they can see their time allotments, how much online time they have left, how long until their "bedtime" (if set) and other information about their online habits. Installation is surprisingly easy and the user interface is simple and intuitive. As an added bonus Circle provides content from across the Disney family for easy access, including Disney's Instagram account and many other sources. People may be surprised to find such a powerful technology product from Disney, but given the family focus of the company it makes sense. 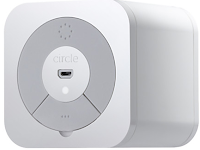 Circle can be found at Best Buy, and retails for about $99 in the USA or $130 in Canada. Not long ago I wrote about installing Linux beside Windows, a free and fairly easy way to get a second operating system on your computer. Linux offers many advantages, including the ability to scan all your Windows files for malware. This can be exceptionally effective because the Windows malware doesn't know about the Linux install, and is powerless to stop Linux from fixing problems. Once the process is done, you should be able to boot back in to Windows and work normally. 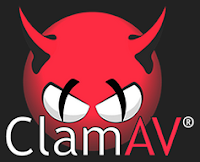 Personally I'm a fan of Clam AV, an open source antivirus engine for detecting trojans, viruses, malware & other malicious threats. Clam AV runs on Windows, Mac, and Linux. For Windows I suggest using Sophos as an anti-malware app, and having Clam available in Linux if you need it. You'll need to enter your admin password when prompted and after that the install will proceed. Having a copy of Linux available on your computer is beneficial for many reasons, but helping to recover Windows if you have a problem makes it priceless. Think of it as car insurance for your computer, you don't need it until you need it, but then it's too late. Have you ever wanted to make a bootable USB drive? It's fairly common, people want to run an operating system from a USB key for multiple reasons, or use it to install a new operating system. If you're considering using Linux instead of Windows a bootable USB drive is a great option. It lets you try out Linux without making any changes to your existing computer. If you decide it's not for you just reboot the computer without the USB drive and you're back to normal. There are many utilities to make bootable USB drives, but one of the easiest also happens to be free. Etcher by Resin.io lets you make bootable images without hassle. Etcher runs on Windows, Mac, and Linux so you can use it on all your devices. Using Etcher is remarkably simple, you launch the app and press the "select image" button to choose your disk image. Etcher supports iso, dsk, img, rawm and a few other formats. After you've chosen the image you select the drive to write it to. This is where some of the magic of Etcher kicks in. Unlike some other utilities, Etcher won't let you select your main hard drive by accident, offering some comfort if you're new to making bootable drives. Etcher offers validated burning, meaning Etcher checks to ensure the image put on the USB drive isn't corrupted so you know it will work. Being able to make bootable USB drives is becoming more of a requirement as technology progresses. Etcher can help you do it without having to learn arcane instructions. Ever needed to share files with someone that were too big to email? Sometimes they may have even been too big to share through dropbox-style services. What do you do if you need to share files with someone securely, or anonymously? This is where OnionShare comes in, a free app that takes care of all these problems. Before you can start sharing through OnionShare you need to start up a copy of TOR Browser. You don't have to go to any special website, it just has to be running to establish a connection to the TOR network. 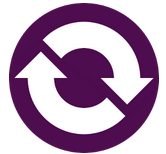 Next open OnionShare and it launches an easy to use graphical interface. 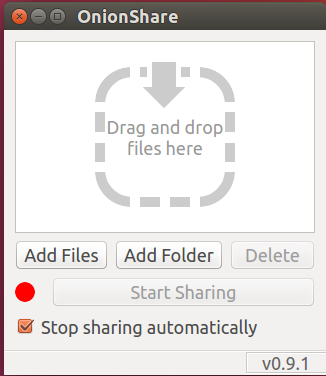 Drag and drop files/folders in to the OnionShare app, or use the "Add file" and "Add folder" buttons. There is a check-box enabled by default to automatically stop sharing files. Leaving this enabled creates a self-closing door. OnionShare works by starting a web server on your computer with an impossible to guess URL, and then makes it only accessible through The Onion Router (TOR) network. Press the "Start Sharing" button once you've tagged all the items you want to share. OnionShare will take a moment to get things set up, you'll see a message saying "Crunching files". Once everything is running the icon will turn green and there will be a "Stop Sharing" button. Below this is a complex random URL. To make it easy to share the location there is a "Copy URL" button which will copy the URL to your clipboard. The recipient can only access the URL through TOR browser, so they will need to have it installed. Entering the URL in TOR browser will bring up a download link to a zip file containing everything you shared, along with a list of it's contents. If you leave the "Stop sharing automatically" box unchecked the service and files remain open to anyone who has the URL. This can be useful when you want to share the same files or folders with multiple people. Because all the files/folders are forced through TOR it ensures it can't be intercepted in transit, or traced back to you, providing anonymity if you want it. The recipient will only know who is providing the files if you've chosen to tell them the URL through a traceable channel, such as your regular email account. If you used an anonymous email account the trail back to you goes away completely. Why would you want anonymity? Some people use this as part of whistle-blowing to provide evidence without fear of reprisal. Personally I just find it a really handy way to transfer large volumes of data from one system to another on a different network if I don't happen to have a USB drive, or if I'm working with someone remotely and I need to get them a large amount of data without using a courier. It's a great way for someone to provide large video files, useful if you have someone doing video editing for you, etc. Since everything is encrypted through TOR in transit I don't have to worry about the contents being read or tampered with. OnionShare isn't for everyone, but if you're looking for a way to securely give someone access to a large file or files it's definitely worth considering. By now most people understand that everything they do on-line at work is logged and analyzed somewhere by default. Did you know it's happening to you at home too? "Oh Homegeek, no one is looking at what I'm doing, I'm not a spy or anything." I hear this a lot, but you should realize your Internet Service Provider (ISP) logs all your internet traffic (at least all they can see), and likely examines it for certain things in order to comply with legal requirements, or to adjust your speed based on traffic type. People can find their speeds dramatically reduced when doing certain things, like downloading torrents, because many ISP's throttle all torrent traffic. ISP's can only do this if they are analyzing your traffic. Well what if you want to surf the web with more anonymity? It's really not that hard to do. Use TOR browser. TOR stands for The Onion Router, a service established in the mid 1990's to provide anonymity and privacy to it's users. The TOR browser funnels all the web surfing you do through the TOR network, vastly increasing your privacy. You can run TOR browser on Windows, Mac, & Linux, and it's free to use. Installation instructions for all 3 platforms are found on the TOR browser website below the download links, and they have made them very easy to follow. So what happens when you use TOR browser? Well it encrypts and bounces your web browsing traffic around a distributed network of relays run by volunteers all around the world. By using TOR browser you prevent somebody watching your Internet connection from learning what sites you visit. It also prevents the sites you visit from learning your physical location, meaning you can access sites which are otherwise blocked. Many people use it to circumvent government controls on access to information in dictatorships. There are some trade-offs for this level of privacy. Most notably Flash and HTML5 content won't work, so it's not for gaming. This is by design to help keep you secure, although you can deliberately allow them. Just be aware that doing so reduces the effectiveness of the TOR browser. Speed will also suffer a bit. Because your browsing is being bounced all over the place it's not going to be blazingly fast. It shouldn't be terrible though, especially since you're not accessing things like Flash. Would I use TOR browser for everything? Absolutely not, in most cases it's overkill. But there are times it makes sense; I might be researching a company's website and not want them to see my connections. TOR browser won't make you James Bond, but it will offer you some privacy for when you want it. Shouldn't you be able to choose what's private and what isn't? For anyone thinking about cutting the cord to their television provider, Kodi is something to strongly consider. It can save you hundreds of dollars a year. I've been using Kodi on my Amazon FireTV for about a year now and it's incredible. With Kodi I can watch pretty much any television show or movie, usually in 1080p or HD resolution, and without commercials. But I did notice I sometimes had challenges finding reliable high-quality streams for certain content, so I set about looking for a solution. In the end I landed on RealDebrid, an unrestricted downloader/streaming service that offers access to many private/paid streaming sources. I subscribed to the 180-day plan for RealDebrid for about $25 CDN, and haven't regretted it for a moment. The streams I now have access to are high-quality, fast, and free of buffering problems that sometimes happen when using free streams. RealDebrid supports many Kodi add-ons including: Exodus, SALTS, iStream, Release Hub, Specto, Entertainment Hub, Ice Films, and 1Channel. Personally I use Exodus and it works flawlessly. For about $50/year I have access to all the content I could ask for, and none of the frustration. At this point you will see a message instructing you to go to the Real Debrid website. Now we just need to activate Real Debrid inside Exodus. Don't worry, this part is faster. 5) Follow the instructions on the screen by going to https://real-debrid.com/device from any web browser and enter the code on the screen. 6) If a message asks if you would like to authorize the Lambda add-on choose Allow. Close and re-open Exodus. Your Real Debrid links should now appear in all your search results. A nice bonus with Real Debrid is they give you "Fidelity Points" when you subscribe. The longer the subscription period, the more points you get. Fidelity points can be converted in to additional subscription time for free. 1000 points = 30 days of service. By using Kodi and a Real Debrid account I was able to completely replace my television service. I can watch all the shows I did before, whenever I want. No need to remember to record a show. All shows have had the commercials removed, so I can actually watch more content in the same amount of time. But Homegeek, I want to watch the local news! No problem, buy a digital antenna and connect it to your TV. Antennas range in price, but a decent one shouldn't cost more that $75 or so. It's a one-time cost, and now you should have access to a bunch of local stations for free. If you've been thinking about cutting the cord I suggest trying Exodus with a Real Debrid subscription. You can buy a 15 day subscription for under $5 to test it out, and purchase a longer subscription afterwards if you like it. The average person has 27 unique web services they use, each of which requires a username and password. 27 is far too many for most people to remember, so human nature is to reuse passwords on multiple sites. It's an easy way to ensure you can get access to all your web services. The problem comes when one of those passwords gets compromised. If you have 27 sites and use 3 passwords, by compromising one password an attacker can probably gain access to almost 1/3 of your web services. It happens all the time, and we are seeing more instances where passwords are stolen, but no one realizes it for years. So what can you do? Use a good password manager to maintain unique passwords for all web service you use, meaning if one web service is breached all your other web services are safe. There are a lot of password managers out there but I recommend Encryptr by SpiderOak, it's easy to use, secure, powerful, and best of all, it's free. Encryptr will suggest strong passwords for each of your sites, it will store them in an encrypted format, and it will synchronize them across all your devices. SpiderOak can't read your passwords because only you know the key to decrypt them. Encryptr works on all major platforms, including Windows, Mac, iPhone, Android, and Linux. Properly using a good password manager is one of the single most effective steps you can take to protect your online services. More breaches are coming to light regularly. The most famous case reported (so far) is the recent Yahoo breach, where over half a billion passwords were stolen in 2014, but no one was notified for two years. It's happened to other recognizable names like LinkedIn, MySpace, and Dropbox just to name a few. Think about how many people might use the same password on their banking site as they did on another web service that may have been compromised. Scary stuff. Using a password manager to maintain unique passwords for each site reduces the threat drastically. Encryptr is free and easy to use, so why wouldn't you want to protect yourself? Remember years ago when Mac users used to proudly say "Mac's don't get viruses!"? Perhaps you know a few Mac owners who still tout this line. It wasn't true then, and it isn't true now. Mac's can get viruses. All computers can get a virus. The number of viruses for a specific platform usually has a correlation to that operating system's market share. Windows owns the majority of desktops, so more Windows viruses are out there than others, but it doesn't eliminate all others. Malware these days is usually created by criminal enterprises, not a disgruntled teenager wearing a hoodie despite what the media might portray. The crooks go after targets that have a good chance of a payoff. The increase in Mac sales resulted in an increase in Mac malware. Well, if you use a Mac you can install OverSight. This free app will tell you when something attempts to access your Mac webcam or microphone, and gives you the option of allowing or blocking the access. Oversight was specially developed to help protect Mac users from unauthorized access to their cameras & microphones, a growing threat given many Mac users believe they are not subject the same security concerns as Windows users. Once installed you're done. The app will automatically run every time you log in. There are full step-by-step directions with screenshots available on the OverSight web page. Unfortunately there isn't a Windows version of OverSight. For Windows users I suggest using a current anti-malware product like Sophos as it's free and effective. If you happen to be using a Lenovo laptop I have it from an insider at the company their webcams are hard-wired to always turn on the indicator LED when the camera is enabled, so you have some extra reassurance there. The bad guys are always trying to figure out how to compromise systems in ways that will make them money. Taking basic precautions these days is simply a must. Tools like OverSight can help. When setting up WiFi in their home many people buy a router, and then try to deal with poor signal and dead zones in their house. Often people will try WiFi extenders or powerline adapters to deal with WiFi dead zones, but these solutions have their own problems. WiFi extenders will increase the range of your WiFi signal, but reduce your speed by around 50% with each extender relaying the signal. Powerline adapters, which use the power wiring in your home to provide connectivity back to your router, often encounter interference and share the bandwidth across all connected devices. Mesh networking is different, it provides the signal range extension without compromising the speed that happens using WiFi extenders, and avoids the interference and other challenges of powerline adapters. This is how many businesses provide WiFi to their employees & guests. The two leaders in the space are Luma and Eero. 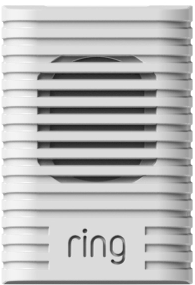 Both provide easy to set up and use mesh WiFi for your home, similar to what you will find in many offices in terms of coverage and reliability, but without the need for an IT department to maintain it. Google announced they are getting in to the mesh WiFi space for consumers now with their "Google Wifi" product. Google Wifi is similar to Luma and Eero in that you can order a single device or a 3-pack. Their pricing model is the most aggressive of the three vendors at $129USD for a single unit or $299USD for a 3 pack. If the Google holds to these numbers they will be $100 less than Luma and $200 less than Eero for a 3-pack, a move no doubt positioned to help them break in to the home mesh space. The company says Google Wifi will be available for pre-order some time in November 2016. Right now some of the technical details aren't clear, and I would need answers before I could suggest this as an option for home users. 1) Google sees all the streaming requests made using a Chromecast. This may or may not bother you, but as I've written lately Google already has a lot of insight in to your online habits. 2) You can't use a smart DNS service to get around geo-restrictions for content. Your ability to take advantage of products like Getflix are impacted using a Chromecast. The only way to defeat this hard-coding is to put rules on your router specifically denying access to Google's DNS servers. (8.8.8.8 and 8.8.4.4 if you want to try.) Once you do this the Chromecast will fail back to whatever DNS provider your router says to use. So if Google is now providing the router will I have that ability? Will I start to see an increase in targeted advertising once Google knows what kind of content I access on all my devices? Right now I can't say, which makes me uncomfortable. It's great to see mesh WiFi becoming so easily set up in the home, but as with everything from Google, how much personal information you surrender to subsidize the cost of the product is a point worth considering. Personally I'll be sticking with my Luma devices. The product keeps evolving and improving, and my WiFi speeds remain great throughout everywhere in the house. If you're frustrated with your current WiFi I encourage you to look at a mesh solution. Just maybe not Google's hardware until we know more. A little while ago I covered how to see just how much Google is watching what you do and search for. It should come as no surprise that a big part of that information gathering comes from your internet searches. Google is hardly alone in this space, Microsoft and Yahoo do it as well. Watching and aggregating your search terms is one way they can all sell targeted advertising. So is there anything you can do if you'd prefer to not have all your search terms indexed and sold? When people ask me how they can exercise their privacy more but still use the internet I suggest people give duckduckgo.com a try and see how they like it. Duckduckgo is a powerful internet search tool that doesn't store your information, doesn't follow you with ads, and doesn't track you. Another interesting tool duckduckgo offers are called bangs. Not like keeping your hair out of your face bangs, in this case they use the !bang function, a powerful option which can let you search results directly from a specific provider. "!Bang commands perform your searches directly on other search engines. Sometimes you know you want to go directly to another site to search, and these commands save you steps in doing so. For example, suppose you wanted to search Amazon.com for 'bags'. In that case, you could just enter '!a bags' into DuckDuckGo and we'll take you right to the correct search results page on Amazon.com. If you've adjusted your region in the Settings menu, your !bangs will automatically direct you to the site for that region, if available. For example, if Germany is selected in the Settings, then !amazon will go to amazon.de." So far I've been pretty impressed with the capabilities of duckduckgo. They have add-ons for your favorite browser to make it your default search engine, and the results probably rival whatever you are using now. If you want to help reduce your digital footprint this may be a great tool for you. After all, we give away enough of our privacy without realizing it, no need to volunteer more if you don't have to. If you're like most people you've been using a lot of Google's products because they are free, convenient, and usually pretty good. Gmail is very widely used, as is Google Maps, Chrome, etc. But have you ever stopped to ask yourself "How much does Google know about me?". You should. By using their products at the default settings you are giving Google a great deal of insight in to your online activities. You actually consented to it when you clicked the "I accept" button on their terms of service. You know, that thing we all never read. "Ok Homegeek, so what can I do about it?" Well to start with, go take a look at what Google actually knows about you, I think you'll be quite surprised. Go to https://myactivity.google.com/myactivity and review the data. You may wish to switch to the Item view rather than the bundle view for ease of reading. If you're using an Android phone and/or tablet you'll see combined activities from your phone and your computer(s) there. This is how Google is able to serve you up cards relevant to things you've expressed an interest in, but also how they have been able to provide targeted advertising to you. Don't worry, you have the ability to delete or bulk delete any or all information they have recorded, but before you do a mass delete remember doing so will reduce how useful Google is to you. Instead I suggest people review the apps and devices Google is gathering information from. At that point you can tell Google to turn off information gathering for specific devices or apps, and you can delete some or all history associated with those items. Perhaps you're more comfortable with location services not being recorded. Ok, but be aware things like recording where you parked your car, or using the turn-by-turn navigation system in Google Maps could be impacted. You can of course just erase your complete digital footprint from Google's servers, but be prepared for the consequences. Most of the helpful features Google has been providing you will stop. Personally I'm not too fussed about most of the items gathered, but I may wish to delete everything more than a year or two old as it's relevance is questionable. Being aware of what information is gathered is always prudent. Adjusting what is gathered and retained will allow everyone to tailor Google's insights to a level they are comfortable with. Remember, when the app is free that usually means you are the product. Today's post is an example of why you should shop your cellphone business. For a while now my personal cellphone has been with Rogers, and I was ok with it because I am a fan of how reliable their network is. Yesterday I noticed my data use was high, this is the second month in a row where I was looking at possible overage charges, something I think is a bit of a cash grab by carriers that will eventually be phased out due to competition. 1) Add an extra 250mb of data (a negligible increase) to my plan but reduce me from unlimited local calling to a limited amount - the bill would remain the same. 2) Increase my data, doubling it for an extra $10/month. Neither option was appealing. I had already checked a couple of other carriers and knew better deals were out there. When I mentioned this the rep suggested I contact Fido to see what they could do for me. For those who don't know, Fido is owned by Rogers. Fido offered to quadruple my current data plan and switch me from unlimited local calling to unlimited nation-wide calling for exactly the same price I was currently paying. I even get 6 months of Spotify (A $60 value) by switching to Fido! All other aspects of my plan remain the same. Of course I signed up, my new SIM card is currently on the courier's delivery truck and will be arrive today. The only cost I incurred was $10 for the new SIM card. I will continue to still be on Rogers infrastructure because that's what Fido uses. I'm pretty sure this process cost Rogers more than $10 in administrative costs when you consider the staff time involved at both Rogers and Fido, plus the processing procedures. Even more impressively they have made it easier for me to leave them completely down the road by unlocking my phone. So why would Rogers do this instead of just offering me what Fido would offer me? They couldn't offer an explanation, but it's definitely less profitable for them. Ridiculous? Of course. But it's something you might want to consider the next time you look at your cellphone bill. Carriers routinely bank on customer complacency to maintain profits. EDIT: I completed my transfer to Fido this afternoon. Time elapsed between inserting the Fido SIM card in my phone until the number was ported = 9 minutes. The interruption to my regular usage was negligible at best. A couple of calls can save you money and offer you a better deal. Isn't it worth checking out? Last week I decided to take another look at running Linux on my laptop. It's been many years since I ran Linux, and I'm happy to say it's improved incredibly. Why did I want to try running Linux? There are a LOT of very powerful free programs available in Linux, and as operating systems go it's much faster than Windows. In fact it's so much faster booting up and running programs that I also installed it on an old laptop that I had previously retired because it was slow under Windows 10. It hums along just fine using Ubuntu and now I have another workstation if I need it. For this trial I downloaded Ubuntu Linux to a bootable USB drive. This approach has the advantage of letting you run Linux directly from the USB to see if you like it before installing anything on your laptop. Years ago installing Linux to dual boot between Windows and Linux was a complex process requiring some command-line skills. I'm happy to say the process is much more user-friendly these days. When booting up from the USB key you just choose the "Install Ubuntu" option. Ubuntu will detect that you already have Windows installed and ask if you want to install beside Windows or overwrite the current operating system. Choose "Install beside". Be very careful not to choose the overwrite option or you will blow away your current Windows instance. At this point you are presented with a sliding scale that lets you drag to add more or less space from your hard drive for Linux to use. In my case I gave Linux 30GB of space. Most of my media & documents are either cloud-based, stored on my network, or on my local Windows partition so I just needed space for the operating system and a few apps. (Linux can see your Windows directories and open/edit files from there if you wish) So far 30GB seems to have been around the right amount for my purposes. The installer takes care of changing the hard drive partitions for you, the process gives you the option of installing all updates as you install the operating system (Something I wish Windows did to avoid the usual half-hour of updating after you turn on the machine) and that's really all there is to it. Not long after you're taken in to the Ubuntu desktop. Unlike Windows your default taskbar is on the left side of the screen, but you can easily move it to the bottom to feel more like Windows if you wish. Ubuntu comes with some great software pre-installed, including a full Office productivity suite that looks and feels a lot like Word, Excel, and PowerPoint. These programs can open existing MS-Office files, and can save in MS-Office format, so you can still exchange information easily with non-Linux users. All these apps are free, as opposed to the $600+ pricetag from Microsoft. Instead of a "Start" button you have the "Search Your Computer" button. You can use this to find and launch apps quickly just by starting to type their name. I suggest pinning frequently used programs to your taskbar or putting them on your desktop. The taskbar includes quick access to your system settings via the gear & wrench icon. For web browsers Ubuntu comes with Firefox, but you can add Chromium, Opera, and a bunch of others, all free. 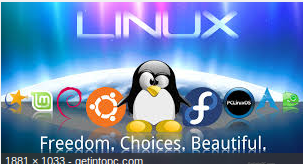 Speaking of free, most software you'd pay for in Windows has a free counterpart in Linux. I was able to easily find a project management app that is a great replacement for Microsoft Project, the icons and functions are quite similar so the learning curve is minimal. All this without the steep pricetag of $929 for a current copy of Project! Using the Ubuntu Software button (It looks like an orange suitcase with the letter "A" on it) I've been able to find free programs to do pretty much everything I do with Windows. The big difference is in the savings. Just between Office and Project I would have to spend about $1,500 for software that is free in Linux. I was easily able to find and install the program that lets me use my fingerprint reader to log in and unlock my laptop, so I haven't sacrificed any functionality vs Windows. But Homegeek, what if you want to go back to using Windows? No problem, when I reboot my laptop a menu pops up asking which operating system I want to use. I just use the arrow keys to switch between the selections and press "Enter" to load that operating system. As operating systems go Linux tends to be a lot more secure than Windows. Because it's open-source that means many thousands of people are reviewing the code constantly. Bugs and exploits are usually found a lot faster, in many cases before being released. If an exploit does make it to a release copy the update to take care of it usually is released faster than you'd find under Windows. I've been running Ubuntu exclusively for a few days now and have done almost everything I've done under widows using it. (Including this blog post.) Since I use Office365 I still have access to native Microsoft apps online while using Linux. As an added bonus if my Windows operating system ever got corrupted I can use Linux to access it and try to fix it. If you're getting fed up with your Windows system or just generally curious I'd suggest giving Ubuntu a whirl. This way you can have the best of both worlds. If your computer is on the older side this is a great way to breathe new life in to your hardware! Normally I write about cool technology for you to use at home, but today it's going to be the opposite. I'm going to post about an app I suggest you don't use. The number of chat apps out there is huge and constantly growing. Some people are die-hard Hangouts fans, others love Snapchat or Whatsapp, but with all the information we put in to our chats did you ever stop to consider privacy? Google's upcoming chat app Allo is an example of trading convenience for privacy. The app claims to learn your style over time and be able to suggest entire message responses for you. Wait, it's going to learn this over time? How? To answer that question I'll refer back to some information Edward Snowden pointed out. Google is going to store all of your chats on it's systems indefinitely. Ok, beyond the creepy factor, I just don't want Google knowing absolutely everything about me and the people I chat with, then monetizing that information. Of course all your chats could also be requested by law enforcement or other entities with a subpoena, but I'm more concerned about an increase in targeted advertising and having that include my messaging app. I already get the occasional spam text, no need to invite more. Let's go one step beyond for a moment. What happens when Google gets breached and has your chats stolen? Would you be ok with your chats being posted to the internet? I know a lot of people who would be either personally or professionally embarrassed if that were to happen. Oh that won't happen, no one can break in to Google! Right. The number of really large corporations that have been breached in recent years is staggering. Even the NSA can't keep their information secure. Why do we believe Google to be any more secure than the NSA? If you're willing to purchase a new messaging app with your privacy as payment that's your option, but many people aren't aware of the possible ramifications. Personally I'll be sticking with Signal. Not because there is anything to hide, I just don't need any more ads directed at me. You've probably noticed that your WiFi speeds vary a lot, depending on where you are in your home. There are many factors that can affect your speed, including WiFi router placement, the construction materials of your home, and pollution from neighboring WiFi routers or appliances. In some cases you might want to know what areas receive better signal speeds than others, this can be exceptionally helpful for determining where to put a streaming tv/video box (like Amazon FireTV), or a gaming console. There is a simple and free app that will measure the WiFi speeds you are getting in any location using your smartphone, it's called WiFi SweetSpots by Assisa Inc. The app is easy to use and can provide information quickly. You can get WiFi Sweetspots for Android here or iPhone here. 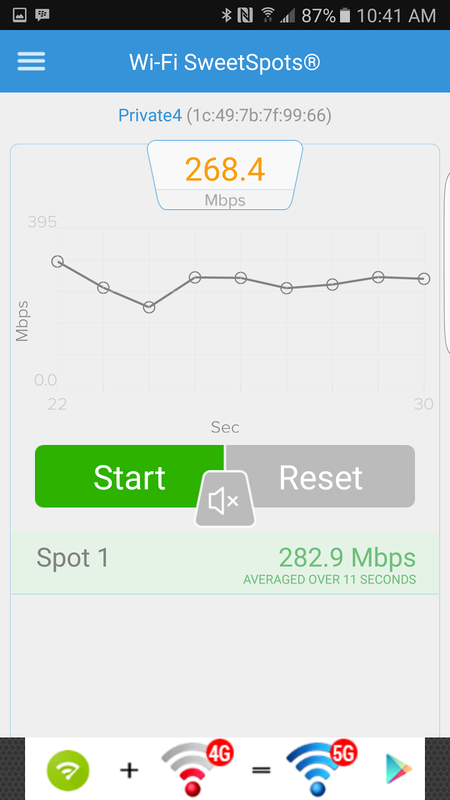 This handy app will start measuring the speed between your phone and your WiFi router. In this case we are interested in how fast can your phone send/receive data to the router, as that should predict how good your overall WiFi experience will be. The app will give you the current speed every second, or provide you an average for as long as you hold down the "Record" button. Recorded averages are automatically logged with names like "Spot 1", "Spot 2", etc. This can be really useful for walking to different locations and determining the connection quality in those areas. If you find that the signal is generally poor throughout most of your home, or in a location where you need a fast connection it may be time to consider upgrading to a new WiFi router, or embracing a home WiFi mesh solution like Luma. Using the app I was able to check the speed in all the bedrooms and can rest easy knowing that while one child will have a faster connection than her siblings, all of them have decent speeds, at least by today's standards. Overall WiFi SweetSpots is a great free tool that you don't have to be a techie to use. It can help you relocate your WiFi devices for a more optimal experience, or indicate it may be time to upgrade without a lot of arcane techno-speak. I get a lot of people asking me what they can do to improve their home WiFi, and I'll be adding WiFi SweetSpots to the list of things I suggest they check. If you've been following this blog you know that I got my Luma WiFi system a couple of weeks ago, and have been using it exclusively ever since. I have to say I am loving the experience, my WiFi has never been close to this fast. Throughout most of the house the speeds are amazing. It's enhanced the performance of my Amazon FireTV boxes incredibly, buffering seems to be a thing of the past. Streaming music is snappy, and of course gaming and web surfing on the various laptops, tablets, and phones is a great experience. Today Luma rolled out three improvements to their app. While the Eero crowd might say "Hey, we did that first!" I'd respond "Not much earlier." It's important to remember Eero costs $100 more, has had longer to work on their software, and doesn't support MU-MIMO. 1) You can now limit the amount of time individual people spend online. You want to tell your kids they can only spend 3hrs a day playing Minecraft? It's now a quick setting inside their profile to say how much time they get, after that their devices are offline until the next day. Each profile can have it's own settings so you can custom tailor your controls to your family's needs. 2) You can now pause individual people's internet connections. Need to get the kids off Facebook for dinner but you need to still do some work? No problem, it's no longer an "all or nothing" setting, you can pause individual profiles with the tap of a button. 3) You can rename devices in the app. This was a big one for me, some of the cryptic names the devices broadcast themselves as are almost impossible to decipher. It's much easier now to use a friendlier name like "Jane's iPad" when you want to manage devices and profiles. These are all great steps in the right direction for Luma, and it shows that the product will continue to improve and evolve over time. There were a couple of challenges I found along the road, and I wanted to share what they were, as well as how to resolve them. 1) When you install Luma you do not get the option to set what DNS servers to use. This is only an issue if you're using a smart DNS service like Getflix to watch video content that isn't normally available in your country. I tried putting my old router back in-line between my internet service provider's (ISP's) modem and the Luma so I could work around the issue but the network began experiencing problems so I took it out again. Later I switched my ISP's modem out of bridge mode and assigned the DNS servers there. It all started working as it should, I was suddenly able to watch Amazon Prime video whenever I wanted. This would be my suggested workaround for anyone experiencing a similar challenge. The problem I experienced using my original router was possibly due to running DD-WRT as the operating system instead of the manufacturer's OS, or it could be an issue with the particular hardware in my router. Either way it's not an issue any more. After this I did notice the Luma app started reporting my download speeds as being less than half of what I was expecting, but when I ran speed tests from the actual devices the speeds were what they should be. I suspect this is just a small reporting bug in the app's calculations and believe it will be corrected in the future. The important thing is my speed wasn't negatively impacted, so it's a cosmetic issue rather than a substantial one. 2) When adding a device using WiFi from a Samsung phone you get an error message. This one actually rests on Samsung instead of Luma. When you set up a Luma over WiFi instead of bluetooth it creates a temporary network so your phone or tablet can talk to it for configuration. Obviously this temporary network has no internet connection, it just exists between the new Luma and your phone/tablet. Samsung's "Smart Switch" technology will pop a warning when you connect to the temporary network saying it has no internet and it will always continue to connect to this network in the future. Sounds dire, right? I thought so too originally and hit "Cancel". That was a mistake. The temporary network is temporary, it vanishes once the Luma is set up, so you need to hit the "connect anyway" button. Once I figured that out I had no other issues getting my Luma units up and running. If you're not using a Samsung phone/tablet you shouldn't experience this issue, but given the market share of Samsung it's worth mentioning. Those are the highlights so far. Overall it's been a great experience, my WiFi is fast & reliable. I've had no complaints from anyone of problems, and the increased speed was welcome. In other words, it just works. If anyone has any questions or comments please leave them below, I'm happy to discuss my experience, and will post updates when they become available.